Many toddlers scream when they want a parent's attention... it's their way of saying "Hey, look at me!" Others scream when they want something they can't have. If that's the case, it usually means, "I want my way... now!" Sometimes the volume of your toddler seems to be louder than usual, not to annoy you, but because they're extra excited. They love to explore the power of their voice, and experiment with using it. My daughter is currently at this stage, and LOVES to let out shrieks every time she sees the cat. Most of the time it's just funny to see and hear, but at times it's been quite a nuisance. 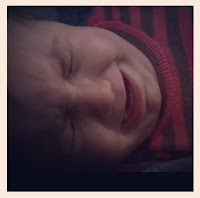 Screaming at your toddler won't help the situation, and would just make it worse. It would send a message that whoever is loudest prevails. If you can, try to avoid situations that can tempt your toddler to raise her voice. Try and divert her attention when she starts screaming. If you're little Monkey is screaming because she's happy, try not to criticize. If it's really getting on your nerves, ask her to use her "indoor voice." Lower your voice, so she will have to quiet and settle down to hear you. Unfortunately it's not always possible to work around your toddler, but whenever you're able to, be sure that she's well rested and fed before venturing out. When you're lugging around your toddler and want to enjoy a nice meal out, stay away from quiet, intimate, or formal restaurants. Instead, go where other families go. You'll feel less embarassed when your child screams in an already loud restaurant. Try indulging in her need to be loud by saying "Let's both scream as loud as we can", and join in the fun with her. Then after a bit, turn down the volume and convince her by saying, "Now it's time to see who can whisper the best." Treat it like a Simon Says game, and switch to other movements... so it makes the screaming seem like one of the many fun things that she can do. If your little one is screaming because she wants attention, is she genuinely uncomforatable or overwhelmed? If you're in a packed environment like a supermarket, it may very well be too much for her. If that's the case, leave or shop quickly. If you think she's just bored and cranky, acknowedge her feelings. You can say something like "I know you want to go home, but it will be a few more minuties until we're done", and push on. She'll feel a bit comforted that you know how she feels, and it will also help her learn how to put her feelings into words. If your toddler is acting up because she wants something, like getting you to hand over a cookie... right away don't give in. Giving her what she wants when she screams only reinforces the behavior. Instead, you could calmly stay, "I know you want a cookie, but we have to finish this first. You can have one once we're done." Errands can be more fun by engaging her in an activity. Talk to her... tell her what you're doing, what's going on around you, and who's nearby. Children are usually quiet when their busy. You can ask your toddler to help you pick up things off of a shelf at the grocery store, or make up a song about what you're doing. Or offer her a snack or a favorite toy while you're shopping. It can be frustrating and stressful at times when you're trying to cope with a toddler who loves to scream, especially when others start giving you dirty looks. Just remember that everyone has been there and try not to take it personally.